We believe that the success of our projects is based on our commitment to serving our clients. We are creative, loyal to our clients and their needs and we are grateful for each and every opportunity we have to make a positive impact on the lives of the people we work with and the communities in which they live. The core principles that guide our practice are Accountability, Compassion, Excellence and Integrity. The personal attention of Marvin and/or René is guaranteed throughout the process. Their plans are based on conversations with you about what you are trying to achieve. No two projects are ever the same, which makes each job unique and interesting. The scope of your project, your budget or your location does not impact the care or level of service you receive. Variance application for home on a corner lot. Building Permit and Variances —Clawson Architects has a record of success! Our Permit Drawings are rarely questioned by the towns. We have a record of success in garnering full approval for variances when needed. While no one can promise you approval from the planning and zoning board of adjustment in your town, Clawson Architects has a stellar reputation and has been successful in some of New Jersey and New York’s most challenging towns. While some may tell you that you “need a local”. We are here to tell you experience and thoughtful designs and organized presentations wins time and time again. Proposed Townhouse Development- 19 Variances sought and approved. Proposed Townhouse Development — 19 Variances sought and approved. Historical Presevation Committee Review —Clawson Architects has a record of success! Our Presentations to Historical Committees have been praised for their sensativity and understanding of historical concepts and detailing. We have a record of success in garnering full approval. 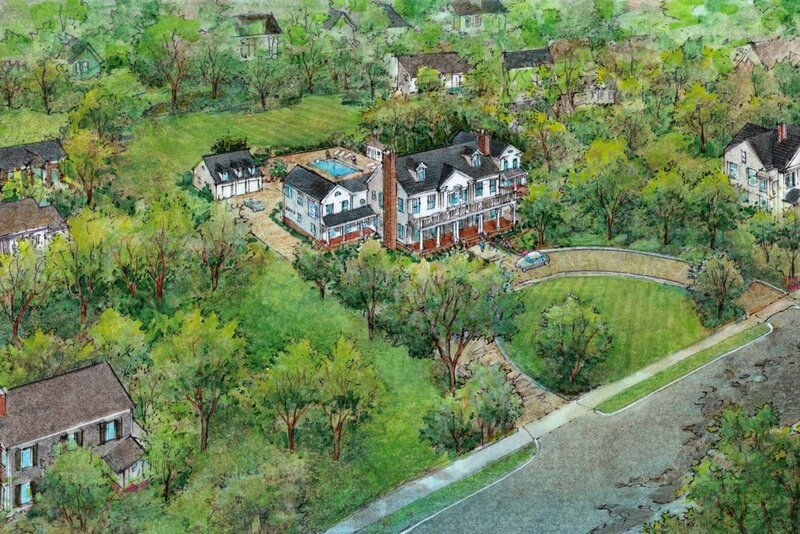 While no one can promise you approval Clawson Architects has a a 100% success rate and their projects have gone on to be recognized by groups such as the Westfield Historical Society in Westfield, NJ. While some may tell you that you “need a local”. We are here to tell you experience, knowledge and thoughtful designs and organized presentations wins time and time again. No project is ever too small. Whether it is a new portico and stoop for your home, renovations to an existing bathroom and kitchen or a new home from the ground up, The Clawson Team of licensed professional architects understand details and scale which will insure that the investment in your home is well designed and executed for long term value. Marvin and René and the Clawson Team work for you. We are not in the business of selling products or taking a percentage of what you purchase or a cut from the contractor you select. Clawson Architects will do their best to educate you and provide you with information so you can make informed decisions and achieve your goals. The size and scope your project determines which steps will overlap and which may not even occur. For example, Existing Conditions for an interior renovation that doesn’t include an addition would not require any site work or surveys, while a new home on a vacant lot would require a site and soil analysis. Members of the Clawson Architects Team hold licenses in New Jersey, New York, Florida, and Vermont. (To verify licensure at each state’s site, please enter the architect’s name.) We are participating members of our professional organizations keeping abreast of the latest technologies and practices.